"Celebrate International Bacon Day with the spokescheeseburger for bacon, Wendy's Baconator. And to make things extra festive, Wendy's is kicking things off with our new collection of bacon-themed desktop, mobile and tablet wallpapers. Download one now! "... check out the all-new Baconator fan page on Facebook. 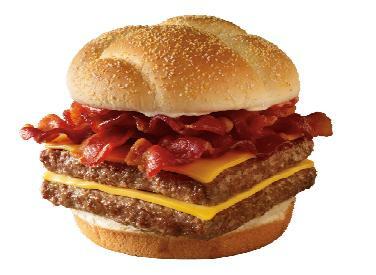 Who better to recognize bacon greatness than the Wendy's Baconator with its six strips of Applewood Smoked Bacon?" The white-bread bun boasts a long, long list of chemical mystery ingredients. Optionals include the healthier stuff: tomato, lettuce, red onion, and crinkle-cut pickles (preserved in salt, vinegar, lactic acid, sodium benzoate, natural flavors, polysorbate 80). It's well-known that I love scrumptious food. And I love a celebration... any fun, life-affirming celebration. But I'd also like to live a long, healthy life. Too many Baconators, and the only healthy result would be the fat corporate coffers of Wendy's International, Inc., parent company of Wendy's and Arby's, a modern industrial corporation that sold $3.4 billion of fast food in 2010. I think I'll mark International Bacon Day with a delicious strip or two of bacon on a salad, instead. I would love to try that one but it has high fructose corn syrup. I just stop eating foods with fructose. I know you already know why.